NEXT | Do you ever feel overloaded with choices? Sorry guys. The instances of the rare Living Infernal Core mount from Gul’dan that were dropping in Raid Finder were apparently not intended. The mount has been in the game since Nighthold’s launch, but it’s a rare drop from Normal, Heroic, or Mythic difficulties. However, after Tuesday’s patch 7.3.2, some people were accidentally receiving the mount in LFR. Today’s hotfixes caught up to what seemed like an unrealistically good change and fixed the bug causing the mount to drop there. You can still get it in the other difficulties though. In other news, Windwalker Monks received a bit more balancing in preparation for the upcoming Antorus raid. 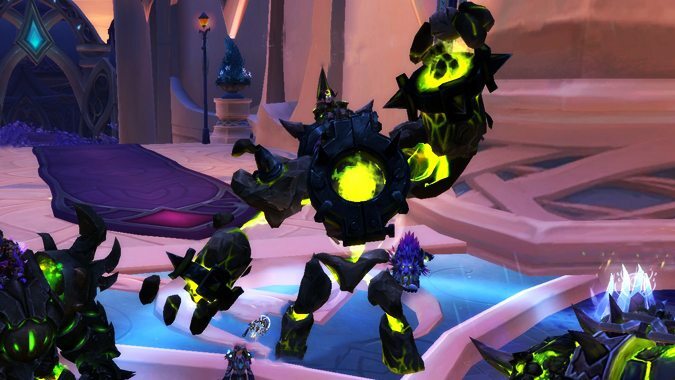 All of their damage abilities were buffed by a flat 15% and the current tier set bonuses were slightly nerfed — the 2-piece bonus for Tier 19 from Nighthold and 4-piece bonus for Tier 20 from Tomb of Sargeras. These adjustments are in line with the other class tuning changes to make sure that Tier 21 in Antorus stays competitive and desirable. Mostly they don’t want us keeping old tier sets over upgrades because the bonuses are too good. Check out the full hotfixes below. Fixed an issue where Khazaduum could not be slain in Krokuun while the world quest “Holding the Spire” was active. Xuen’s Battlegear 4-piece bonus now increases critical strike chance of Rising Sun Kick by 30% when Fists of Fury ends (was 65%). Resolved an issue that could cause “Captain” Cookie’s Throw Food from throwing food as intended.